I am always on the lookout for new recipes which are both easy and delicious, and this one definitely fits the bill. I have to thank my Mom for sharing it with me, as it has quickly become my favorite chicken dish. And when I tell you it’s delicious, that’s really an understatement. Seriously, it is the bomb! This recipe calls for fresh spinach, but I opted to go with creamed spinach simply because I love it. 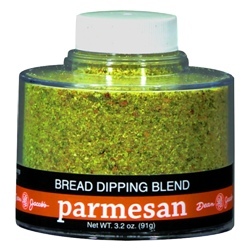 I had a hard time finding the bread-dip seasoning so I made my own using 1 tsp. Parmesan, 1/2 tsp. each: oregano, garlic powder, and kosher salt, 1/4 tsp. each: dried basil, parsley flakes and onion powder, and 1/8 tsp. each: thyme and tarragon. Grind spices until fine, then add the Parmesan to spices and mix well. Store in container until ready to use. Combine soy sauce, molasses, garlic powder, and 1/2 tsp. pepper. Place mixture in bag and add chicken, turning to coat. Let stand at least 10 minutes (the longer, the better) or overnight in the fridge to marinate. Toss fresh onions with oil, salt, and remaining 1/4 tsp. pepper. Place onions in 13 x 9-inch baking dish; top with chicken. Bake 20–25 minutes or until chicken reaches 165°F. Top chicken with crispy onions and cheese; bake 2–3 more minutes or until cheese melts. Combine both dressings; microwave on HIGH 20–30 seconds or until hot. Drizzle sauce over chicken and serve. Place spinach in microwave-safe bowl and cover; microwave on HIGH 4–5 minutes or until tender. Drain, if needed. Stir in butter and seasoning, and serve. 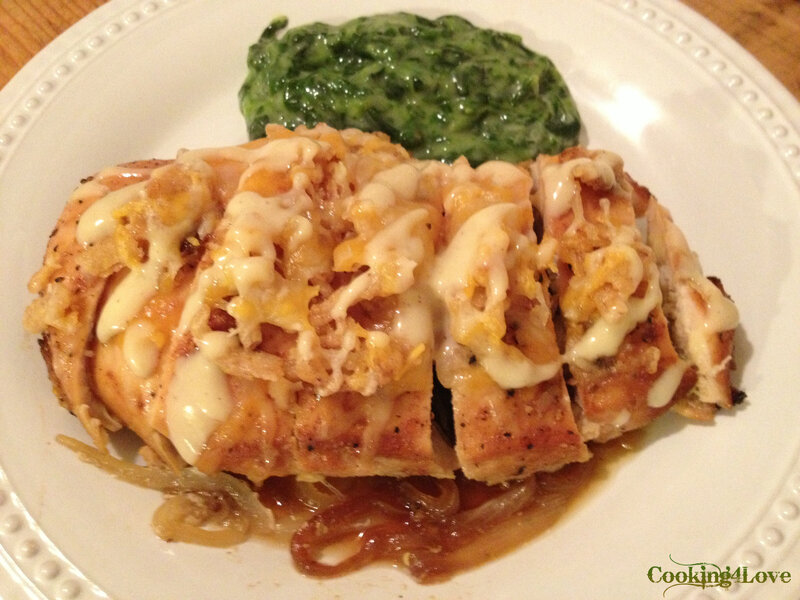 This entry was posted in Chicken, Main Courses / Dinner, Recipes and tagged caesar dressing, caramelized onions, chicken, dinner, easy, french-fried onions, honey mustard dressing, molasses, quick, soy sauce, spinach. Bookmark the permalink.